It is so rare to see DC covers shine on the Cover of the Week posts, that when they do, I am always genuinely surprised. What you should not be surprised about is how incredible an artist Francis Manapul is. His mergence of pencilling, inking and colours produces a elegant and gossamery feel. Even his darker panels are alight with sparkles of colour whether it is from a solitary star or the spark of gunfire. These effects are demonstrated on this cover. The actual drawn section is classically Manapul with a gorgeous composition of the central characters of the story. The pictorial is smooth and well transitioned but it is the colours than blend nicely from yellow, to green to red, ending with Batman as the small character at the base of the page. The prettiness of that panel is enough to warrant the coveted cover title but the layout of the page is very cleverly done. It adds in a danger element to the page because it features a gun. Even the border of the gun is coloured orange to red at the bottom. It merges with the image and leaves a pool of blood with bullet cases shed aside. It plays into the non killing stance of Batman, and makes you believe someone will be injured and potentially Batman may not be able to stop it. A final touch is the title design because I have always been impressed at how Manapul and Buccellato trimmed the old header and use half a Bat symbol. The font has also changed because it is an inconsistent black resembling the use of an ink stamp. 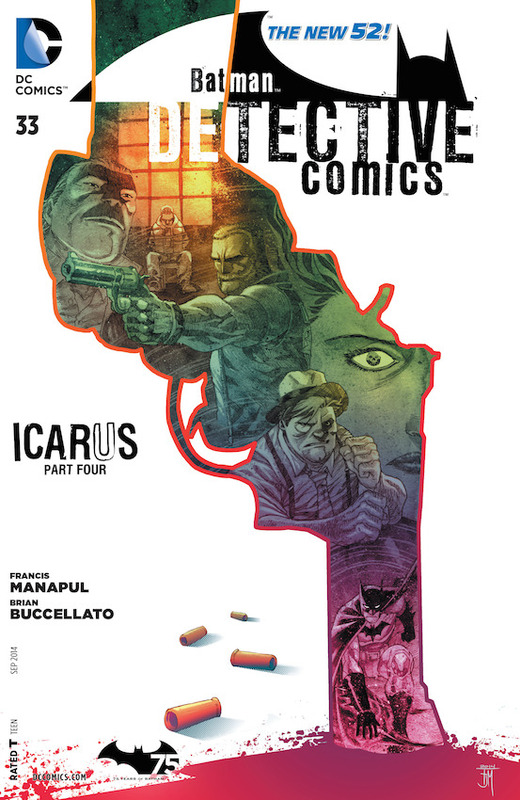 As the gun invades the title it converts the Detective Comics title into a white colour, which produces a wonderfully aesthetic effect. The whole cover is impressive from art to colour to composition and reinforces my belief that Manapul is one of the best artists not only for DC, but out there altogether.